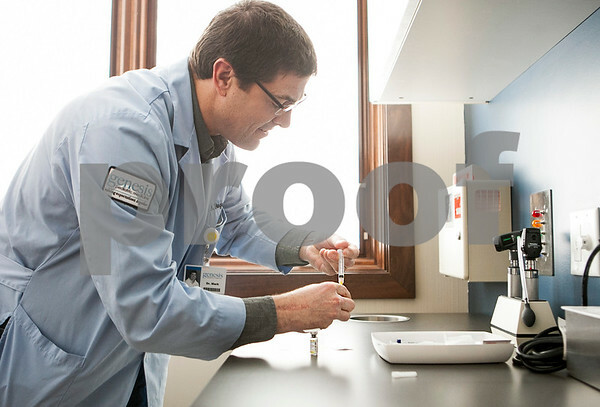 Dr. Mark Regnier, of Genesis Pediatric Medicine in Sycamore, draws a vaccine on Thursday, Feb. 12, 2015. The State of Illinois allows residents to opt their children out of immunizations for religious and medical reasons. In DeKalb County, the percentage of school children who were vaccinated fell slightly between the 2003 -2004 school year and the 2013-2014 school year, shifting from 99 percent to 98 percent. The rate, however, remains above the compliance level of 90 percent required by the Illinois State Board of Education.